"Publish or perish" is a well-known phrase in the academic world -- if your work isn't published in professional journals, your career will perish. The high-end audio industry should adopt a parallel mantra -- demo or downfall." That is, the only way for high-end audio to thrive is to demonstrate, to one customer at a time, the joy of hearing music wonderfully reproduced. There's simply no substitute for hearing your favorite music recreated with an involvement and intensity you never thought possible. The demo allows you to instantly "get" what high-end audio is all about -- a phenomenon I've written about previously ("Ten Minutes in the Sweet Spot"). Hearing descriptions of high-end audio, reading magazines, or looking at pictures of great gear will never begin to convey that electrifying experience of connecting with music at a deeper level. I'll bet that every one of you vividly remembers your first high-end experience and the resulting epiphany. You instantly knew that you had to have the gear that would deliver that thrilling experience night after night. The fact that there's no way for music lovers to discover our hobby or for manufacturers to find new customers other than by demonstration leads to the inescapable conclusion that the high-end audio retailer is the linchpin of the entire industry. It's the retailer who's on the front-line representing high-performance audio, and who is essential to its survival. The retailer isn't just vital to the industry's health -- he's also the surest path to your long-term musical satisfaction. There's no substitute for the value added by a skilled and caring dealer. When I'm asked for specific equipment recommendations I always begin by saying: "Shop for a dealer, not for equipment." That aphorism reflects my belief that if you find a great dealer, you'll end up with a great-sounding system. It's no secret that high-end dealers have had a rough time over the past ten years. The first blow to the industry came, ironically, in the form of home theater. Many traditional dealers were tempted by the huge influx of money from homeowners wanting "media rooms," and whole-house audio, lighting, and control systems. Sound quality was a distant afterthought. When the fever for home theater cooled, many dealers were left high and dry. The second blow, of course, is the current economy. Lately there's been a resurgence of the traditional values espoused by high-end retailers, and many who converted their store's two-channel listening rooms into theater demo rooms have switched them back to music rooms. Performance-based audio, and the musical involvement it delivers, is ascending as customers tire of the shallowness of remote-controlled lighting and whole-house in-wall speakers. Music is a universal human need that transcends the latest technological fad. There are many outstanding high-end retailers who deserve our recognition and support, and we intend to spotlight these exceptional dealers in the coming months by publishing profiles of the country's best audio stores. In the meantime, I encourage you to develop a long-term mutually beneficial relationship with your local stereo shop. You'll not only end up with better sound; you'll also be supporting the vehicle that will bring the high-end audio experience to a new generation of music lovers. I'm deeply saddened to report that Stereophile founder J. Gordon Holt passed away on June 20 at the age of 79 after a long illness. HP has written a remembrance in this issue, and I wanted to add my own thoughts on Gordon's contribution to our field. The word "contribution" is far too weak; Gordon created, from scratch, the entire profession of subjective audio reviewing. He was the first writer to honestly describe how products sounded and to elevate the listening experience over measured performance. To accomplish this, he had to invent an entirely new language to convey to the reader how an audio component interpreted the musical experience. It's that same language that we use today -- and take for granted. Gordon's writing was a model of concision and clarity and wit. He had the ability to explain in a sentence what many writers failed to convey in a page. 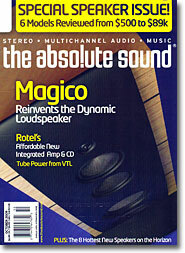 I had the great fortune of working with Gordon as Stereophile's Technical Editor from 1989 to 1997. On a personal level, he was a role model and mentor. In the larger view, the high-end audio industry wouldn't exist as it does today without J. Gordon Holt.